Gov. 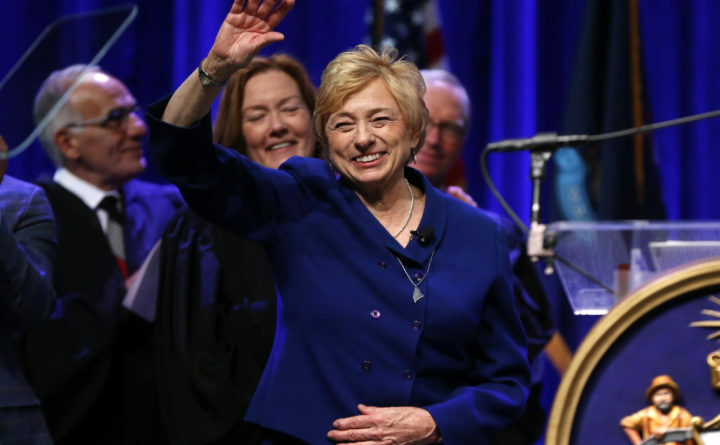 Janet Mills acknowledges applause after taking the oath of office, Wednesday, Jan. 2, 2019, at the Augusta Civic Center in Augusta, Maine. Mills, a Democrat, is the state's first female governor. I’m not terribly interested in litigating old political issues, but Michael Cianchette is, and he’s wrong about them in his Jan. 4 BDN column. He complains about some historical political moves by Democrats, then claims the moral high ground by hoping Republicans in the Maine Legislature don’t act similarly. Let me point out a few differences. First, he makes the familiar claim that Robert Bork was wronged by Sens. Joe Biden and Ted Kennedy and other Senate Democrats in 1987, and that that Senate rejection laid the groundwork for the modern politicization of Supreme Court nominees. It is important to remember that Robert Bork was the picture of an objectionable witness before the Senate Judiciary Committee. He was argumentative, smug and generally unlikeable to senators on both sides of the aisle. He had been compliant in Nixon’s Saturday Night Massacre. Six Republicans voted against his confirmation. His failure to be confirmed was not solely political — it had to do with his personal and professional shortcomings. Cianchette compares the nomination fight of Bork with that of Merrick Garland. Judge Garland’s personal and professional merits were never debated, due to the unprecedented decision of Senate Majority Leader Mitch McConnell to deny him a hearing. Cianchette offers a straw man in comparing these two Senate battles — one was purely political, but not the one his argument relies upon. The Garland sham informed the Democrats’ response to the nomination of Neil Gorsuch. We were angry and generally opposed his nomination not on his merits, but based on the treatment Garland had received. This treatment, I’ll grant Cianchette, was more political than anything else. But it was principled. Three Democrats voted to confirm Gorsuch. Finally, Cianchette casually claims that the Democrats’ opposition to now-Justice Brett Kavanaugh were “more political than principled.” Really? I haven’t the room here to list the principled reasons that Democrats fought against his confirmation to the nation’s highest court. I’ll mention his extreme views of executive power, his out-of-the-mainstream opinions on women’s rights, and, of course, the credible accusations of sexual assault that were leveled against him in the hearings. Kavanaugh would have definitely been defeated by a larger margin than Bork in the 1987 U.S. Senate. Democrats are not innocent of playing politics in matters of judicial nominations or any other area of government. Neither are Republicans. Cianchett’s plea to GOP legislators to vote for Gov. Janet Mills’ nominees based on their qualifications is a not-so-implicit jab at Democrats for not using that rubric in their votes. To date, Mills has re-nominated three LePage administration commissioners. Let’s be honest with our history, and give the new governor and Legislature a fair chance to do right for our state. Shaun Riggs owns and operates a restaurant in Farmington.